In the interest in sharing how this camera is setup I have created this document. If you want to duplicate what we have done at Royal Oaks please feel free to do so, there is very little that is custom other than a couple server side scripts that I will outline. I can share these scripts if anyone has any interest, however it is self-serve. I have included links to external links where appropriate to steer interested folks in the right direction. Interested parties can email doug at pacifier.com with questions. 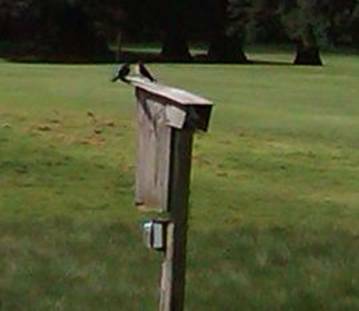 The bird house that the camera is located in is located roughly 100 yards South East from the Club house at Royal Oaks, If you are standing on the first hole Ladies Tee you will see it in the natural area. The bird house is a simple design bird house that is approximately 8� x 8� x 14�, the birdhouse camera is mounted in the dead space near the top of the bird house.